Sue Loncaric is an Australian blogger and the inspiration behind Sizzling Towards 60 and Beyond. She writes about positive aging and embracing health in all areas – body, mind, spirit and in our relationships. 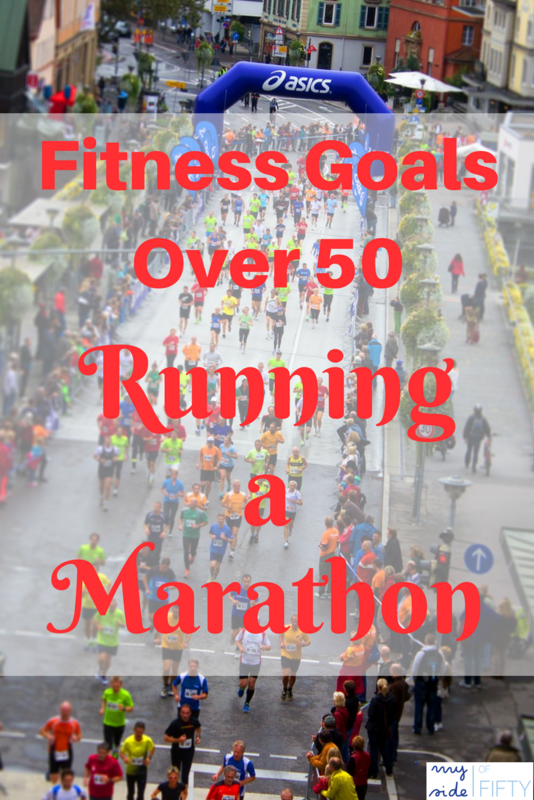 Today, Sue brings us the first guest post in my new fitness series: Fitness Goals Over 50 | Running a Marathon. I ran my first marathon at 55 years old. Do you shy away from leading a fit and active lifestyle because you think you are too old? Are you placing limitations on yourself by focusing on your age rather than your ability? If you answered ‘yes’, then I hope that after you read my story you might be inspired and motivated to make some healthy lifestyle changes and start living life to the full. Like many young girls, growing up I did dancing – ballet, tap, jazz and highland dancing. I then achieved my dream and opened a ballet studio at 15 years old, which I continued for about 15 years. I was never athletic at school and tried to keep fit with aerobics back in the 80’s after I had my family. However, like many, life took over and I just didn’t have time (my excuse) or MAKE the time to keep fit and healthy. I would probably rate myself around 3.5 stars for health and fitness back then. Of course, now I am 60 and over the last 10 years, my attitude toward health and fitness has certainly changed. Having lost my Mum at 60, Dad at 66 and my brother more recently at 65, all to various forms of cancer, as I neared midlife I was very conscious that I needed to make sure I did all I could to live a healthier lifestyle. I wish I had known when I was 30 what I know now but the important lesson I have learned is it is never too late and we can achieve anything if we stop placing limitations on ourselves. Fitness Goals Over 50 – When did I catch the running bug? Just before I turned 50, I worked with some girls who were almost young enough to be my daughters. The wonderful thing was they never thought of me as an older person. I was Sue, the individual. They encouraged me to start running and booked me into Bootcamp, 2 mornings per week. When I reminded them of my age and that I was old enough to be their mother, they wouldn’t accept it! I have these girls to thank for starting me on the running path, having the confidence in my ability and not accepting excuses such as ‘I’m too old’. I then started running with some ladies I met through my daughter. We call ourselves the Saturday Sisters and are still running together each week 8 years later. One Saturday I told them I wanted to run a marathon before I turned 55. 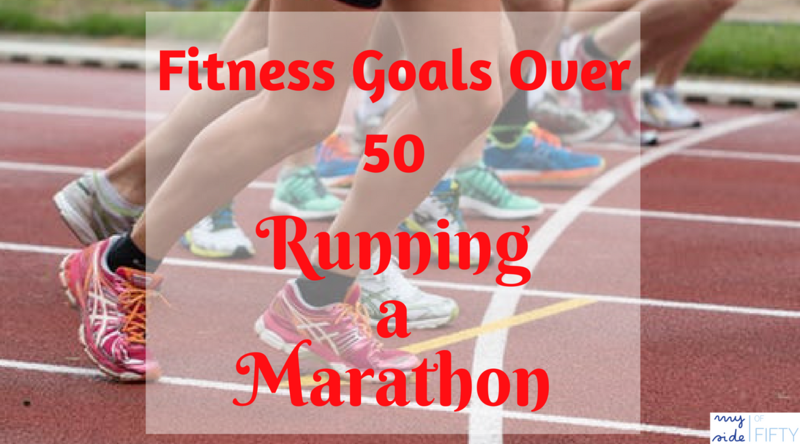 I had run a half-marathon at 50 and so my next goal was the full marathon. Once I had told them my goal, my pride would not let me back out and so I started training and preparing. My friends trained with me for the long runs and one of them actually entered and ran the marathon with me. At 55, I ran a full marathon. Crossing that finish line, to the cheering of my husband, daughter, and friends, I felt such a feeling of elation. I had achieved my goal in the time I wanted and although I was tired it couldn’t overshadow my excitement and happiness. I know that running isn’t for everyone but that shouldn’t be an excuse not to include daily movement in our lives. The key is to find something you enjoy and can have fun with, and you will be more likely to stick to it. Need help evaluating an exercise program to see if it’s right for you? Get my Exercise Evaluation Checklist. Although I ran a marathon, you might have a different health or fitness goal. 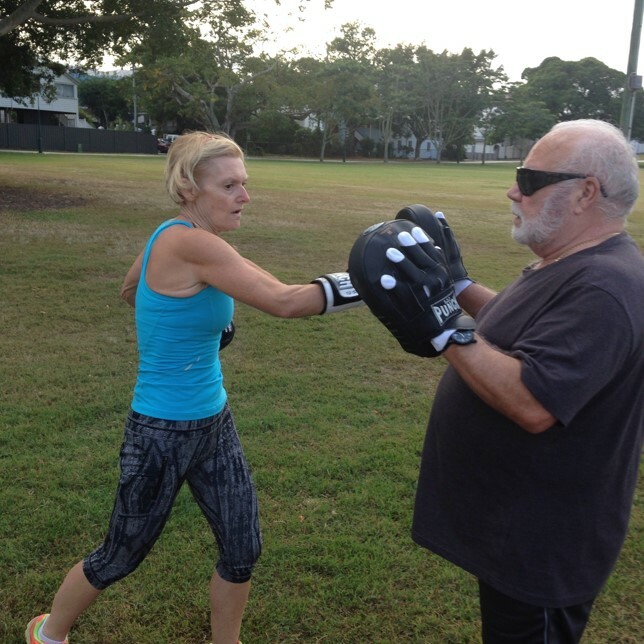 I would like to share with you 7 tips to help you achieve any fitness goal after 50. These tips are based on my marathon training but basically can be adapted to any fitness goal. You don’t need to run a marathon to be fit and healthy! Disclaimer: Sue Loncaric is not a physician and any information provided here is not meant to be a substitute for medical advice. Please consult your healthcare professional before embarking on any exercise plan. Before you start any new form of exercise or increased training after 50 you really need to have a full medical checkup and get the approval from your doctor. If you haven’t been active for a while, this is vital as it is easy to pull muscles or sustain injuries. You need to build up your fitness and this takes time. I could not have achieved running the marathon without my husband. He accepted and encouraged me to achieve my goal and helped by preparing healthy meals and putting up with me getting out of bed at 4 am some mornings to fit a run in before work. If I didn’t feel like training, he would encourage me and remind me of what I was working towards. My Saturday Sisters were so supportive and trained with me each week. Working out with a group of friends helps to motivate you to keep going. This was vital as the longer runs kicked in as running 38 kms on your own can be difficult. As I had made a commitment to meet them at a certain time for a run, I would make sure I was there. Ask for professional help from a personal trainer if you aren’t sure where to start. When you have made the commitment to your goal, it is easy to get carried away with the initial enthusiasm, only to find that soon that enthusiasm starts to wane. Breaking the goal into baby steps allows you to achieve at a regular rate, celebrate the success and keep moving forward to the end goal. When I first started running, I couldn’t run more than 25 meters between two lamp posts which wasn’t very far at all. I made the goal to start by alternating walking and running. For example, a 5 – 10-minute walk to warm up then a jog then back to walking. I gradually increased the distance I could run. By taking it slowly and adding distance each time I ran (or walked) I felt like I was achieving something more. This, in turn, motivated me to keep going. It also gave my body time to adjust and build up strength for longer walks or runs. You might also like to read my posts on Walking Your Way to Fitness from Beginner to Advanced Levels. Strength training is so important after we reach 50 because it strengthens our bones, improves our posture and helps reduce the chances of osteoporosis. Strength training improves core strength so I made sure that I did some gym work revolving around that. Exercises like the plank, tummy crunches, squats and light weights all helped to improve my overall strength in addition to the running. Yoga and stretching also helped to reduce the chance of injury and keep my body flexible and my mind calm. Having never run a marathon before, I researched training programs from the internet and found one that would be suitable. I needed to educate myself on what foods to eat to provide me with enough energy during the training runs and also the marathon itself. To be totally fit you need to vary the type of exercise and watch what you eat to help your body perform at its optimum level. My husband was great and made sure I had everything I needed to keep up the energy levels. Keeping hydrated was a top priority so getting into the habit of drinking enough water each day was vital. It also meant giving up alcohol which dehydrates our bodies. Save the champagne for when you have achieved your goal. Taking a rest day or two to help the body recover is vital as is getting a good night’s sleep. This is the time the body repairs itself so make sure you factor in days to rest and recover. To me, this is the most important tip of all. When we reach midlife we start to focus on the number rather than living life. We start to question our ability and our self-confidence can take a dive. It can be daunting trying something new. Setting a goal and working through these tips will build resilience, self-confidence, and motivation. What is one thing you can do today to start living a healthier and happier lifestyle? Fitness Over 50 | Are These Popular Programs For You? Which Exercise Program Should I Join? With all the options out there, it's hard to know which one is the right one for you. Subscribe to My Side of 50 and get my FREE Exercise Evaluation Checklist. Know what to look for and the questions to ask before you commit! Thanks for subscribing to My Side of 50! Now check your email to confirm your subscription. Sue shares her journey through midlife to encourage others to join with her in her quest to live a fit, active and fun life. Sue loves connecting with people and helping them realize their full potential to be the best they can be! Her e-book ‘From Couchpotato to Fabulously Fit in Less Time Than You Think’ has evolved into a Facebook Group #couchpotatotofabfit and encourages others to Get Healthier Together. Her online self-development course ‘The A-Z Guide to a Happier, Healthier Lifestyle’ has been well received with more courses are on the way. Since taking early retirement, Sue found she needed more in her life and Sizzling Towards Sixty was born. 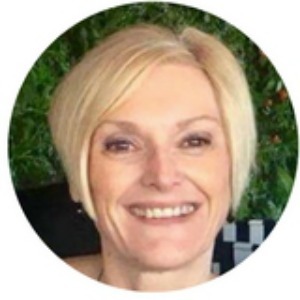 Sue invites you to join her to ‘Ride the Wave of Midlife with Positivity, Fun and Laughter’ Sue shares her journey through midlife to encourage others to join with her in her quest to live a fit, active and fun life. 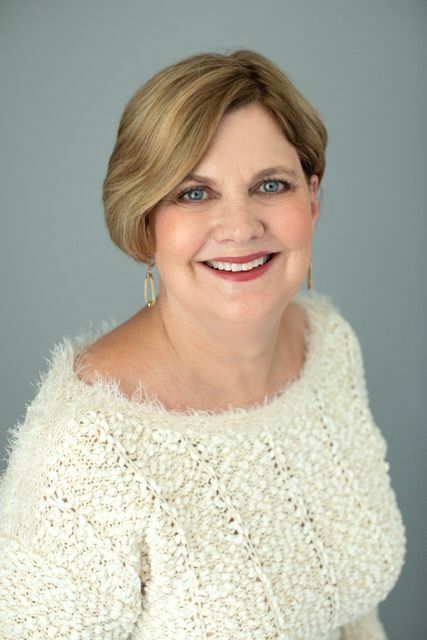 Sue loves connecting with people and helping them realize their full potential to be the best they can be! Her e-book ‘From Couchpotato to Fabulously Fit in Less Time Than You Think’ has evolved into a Facebook Group #couchpotatotofabfit and encourages others to Get Healthier Together. Her online self-development course ‘The A-Z Guide to a Happier, Healthier Lifestyle’ has been well received with more courses are on the way. Hi, Cathy – Thank you for featuring Sue with such an important topic. Although I am not a runner, I greatly admire those who do, especially those like Sue, who began running later in life. I am a long-distance walker, hiker, and yoga addict. I also throw in trips to the gym, and sport like pickleball for good measure. I agree that consistent baby steps are the key to getting anyone from where they are today to the fitness goals that they would like to achieve. Awesome guest post! This is so inspiring Sue!! I love the idea that we can do anything…no matter what our age. It takes a little work and a lot of dedication, but why not?? Inspirational, Sue! Full marathons – wow! Non-athletic me trained for my first half-marathon when I was in my mid-40s and I have ran/walked 4 more since. I’ve had to stop for a few years due to some health issues but I can see myself getting back into something like this again when I retire (with doctor’s blessing, of course). I love the months of training as much as or more than the actual event – although the big races are an awful lot of fun. Keep on running! Hi Deb! Yes I enjoy the training because I run with my Saturday Sisters and the time we spend together is more than running it is friendship at it’s best. We are hoping to run another full marathon this year and are training hard. I will see how my body holds up and make a decision closer to the time. But what is the worst that can happen? You have to give things a go don’t you? Have a great day! Great guest post. Running a marathon after 50 is a fabulous achievement Sue. Your tips are really great. The top re nutrition is a reminder to me that I have to tighten up my nutrition. Thanks for sharing my story at #MLSTL, Cathy. It is always lovely to have you join us. Happy 4th July! Great party, Sue! Love all the midlife perspectives in each and every post. I celebrated turning 50 by running a marathon. One of my dearest friends was at the finish line to put my medal around my neck and my husband and son were at the finish line cheering me on. It was the best feeling in the world!! Kim – what a marvelous way to celebrate your birthday. Doing something hard and achieving your goals with the support of friends and family is the best! Molly it is so hard to get back into things when something like a couple of falls totally derails us! I hope by the time you are reading this response you’ve “gotten off the couch” and started moving again! Sue’s post certainly inspires us to do just that! Sue is the ultimate in Midlife fitness examples! I can’t believe how much she manages to do (and to enjoy) and it certainly reaps benefits. I’ll never be a runner (I’ve tried and failed a few times) but a good walk in the fresh air is my answer to keeping fit – some strength training would probably be a good idea but is still on my “one day” list! Thanks for sharing the post, Leanne! Sue’s post is a great reminder to find what we enjoy and just move our bodies! Hello Cathy and Sue! 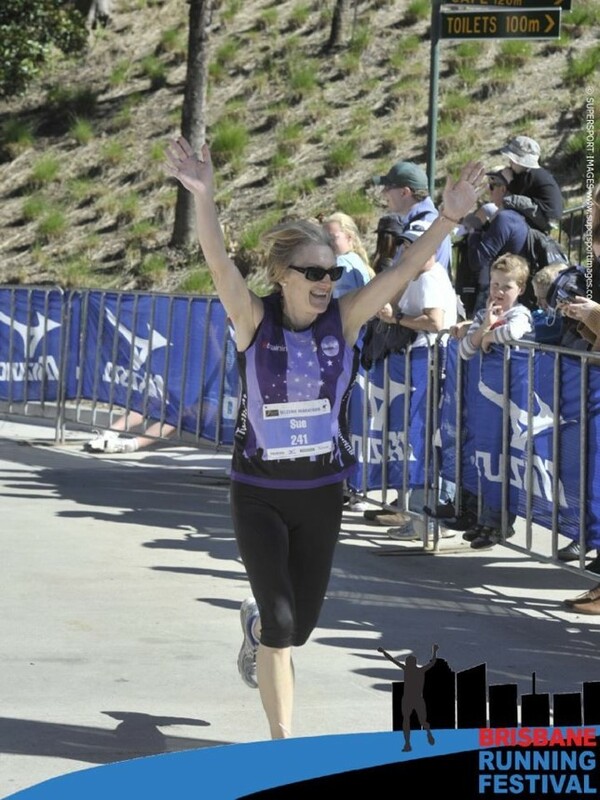 I really enjoyed reading the story behind Sue’s first marathon. We share a love of running, and I knew Sue ran her first marathon at 55, but I didn’t know how that came to be. It’s so great to have friends of all ages, especially when they encourage us to stretch ourselves. Good luck with all of your goals–fitness and otherwise! Christie – I agree that it was so wonderful that Sue had friends of different ages who encouraged her. Where would we be without those friends who push us to be our best. I always do better in a group with any fitness challenge I am working toward. I absolutely love everything about this post! Your attitude to life Sue & your target is to be commended. Getting over your grief of losing those close to you through positivity & mental strength. Exercise certainly does make the body feel better in so many different ways & of course helps keep you young fabulous positive post. Congratulations on your marathon Sue!! Sue is such a great example of a positive attitude and taking things step by step to meet your goals. Glad you enjoyed the post, Samantha! My name is Cathy. I am an over 50 wife, mother and grandmother who is embracing new challenges and adventures that come from being on "this side" of 50. Join me on the journey! Tie A Scarf 3 Ways! Like to accessorize with scarves, but are bored with the way you are tying them? Subscribe to the My Side of 50 and get 3 Fashionable Ways to Tie a Scarf! Success! Now check your email to confirm your subscription and get your Free Download of 3 Fashionable Ways to Tie A Scarf. My Side of 50 is a participant in the Amazon Services LLC Associates Program, an affiliate advertising program designed to provide a means for us to earn fees by linking to Amazon.com and affiliated sites. @2017 - My Side Of 50. All Right Reserved.